Why “Target Audiences” Can Mean You Losing Your Potential Customer! If there is one phrase which sends shivers down my spine it is the one which includes the words “Target” and “Audience”. Allow me to explain why that is. I have come across companies who have concentrated so much on attracting their “Target Audience” that they forgot about the potential audience they already had. If you think that your “Target Audience” is limited to those people who already know your company and your product or the service you provice – think again. The above people are the ones who you have already caught on your last “fishing trip”. As long as you don’t upset them or make their life too difficult they are the ones who are likely to stay around. Your real “Target Audience” may surprise you. It is those people who treat your website (and your other literature) as an oldfashioned “shop window” as they decide whether or not to give your company their custom. However, they are not the most important people. The most important people are the ones you have decided to invite for a job interview. How do I work that one out??? Simple (and this actually put me off the idea of even going to an interview with one company – I went but only because I had to as part of my Jobseekers Agreement when I was unemployed). If your potential employee cannot find their way around your website well enough to be able to research your company – they are likely to feel you treat your employees in the same way as those potential customers who contact your company “on spec”. The company whose website put me off them were dismissive when I pointed out that I had had difficulties in using their website (in fact it was the worst one I have ever come across before or since). They informed me that – not only had the website won an award (I get the feeling the RNIB were not included in that particular judging panel) I was not in their “Target Audience” – so they were not going to change it. I am not sure if they are but – I think websites are used to such an extent that they should be covered by the Equalities Act. After all, if I cannot read a website for any particular reason I cannot help but feeling as though I am being discriminated against as a result. Your website is your showcase to the world – try to remember that everybody is your “Target Audience” in one way or another. I am one of those very strange people who are not obviously “disabled”. Actually – that is not totally correct. You see – my glasses will tell you that I have some kind of sight problem – they just don’t tell you exactly how bad it is. Nor do they tell you what does and does not make my life easier. A few months ago I went to a job interview where I ended up feeling extremely pleased with myself on one hand but highly insulted on the other. The reason I ended up feeling extremely pleased with myself was hearing “You don’t look Partially Sighted”. 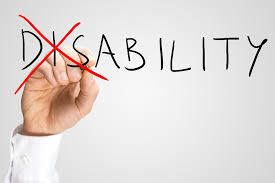 I know you are not really supposed to mention your disability in a job interview (although I did manage to get the offer of a job as a School Crossing Patrol even after stating my sight problem – I failed on the Medical though) but I like to think that everybody knows where they stand. What made me feel highly insulted was one of the questions the interviewers asked me. “What was the most recent film you saw?”. I took this to mean in a cinema and answered it as such. Put it this way – me and cinemas do not mix. Cinemas have a tendency to hit all my danger buttons at once. If they had asked me about the latest book I had read I would have been able to bore them to sleep about it. Me? I would either be a Stroopwafel (a delicious Dutch treat which goes very nicely with coffee) or one of those cinnamon-y, gingery biscuits you get with a cup of coffee in upmarket hotels and restaurants. There are times when I really wish I could lend my eyeballs to the rest of the population. Not only would this give me a rest sometimes – it would also enable other people to see what I can (or more precisely cannot) see with and without my glasses on. The photograph had a “placeholder” at each corner which might tell you what you were looking at but the main picture was blurred to the point where I knew what I was looking at. The photographer wanted to take the “placeholders” out as he thought it would give the game away as to what the photo was of (when people with “normal” vision looked at it). One of my favourite things to look at without my glasses on may surprise you. It is the back of cars. When I have got my glasses on I can see that the indicator light, backlight, and brakelight are all built in to the car – even when they are illuminated. Without my glasses on the brakelights of cars and the indicators develop a more surreal quality than most other objects. When the aforementioned lights are lit up they look like dandelion clocks but – obviously – in red and amber. They also stand out from the car. Maybe your “Solid State” world and my fluffy world are totally different on paper but I am really looking forward to welcoming you into my fluffy world and educating you. After all, not many people on Planet Earth have got absolutely perfect vision. I admit that I am in the lowest percentage of the population who have got any king of “vision” but everybody can teach everybody else about their life as they know it. We just need to open our minds and expect the unexpected. You may think this is an exaggeration – unfortunately, if anything it is an understatement. OK – so the food was slightly more expensive than I expected it to be. But at least you could choose your own toppings for your burger (the Brooklyn Beer is not bad either). Oh – and you had a choice between salted fries and “Cajun” fries – these were more like proper chips of the kind you would get from somewere like “Awesome Chips” (outside the Haymarket on Belgrave Gate in Leicester) than the excuse for chips served up by most fastfood places. However, the food wasn’t what made me like the place. Every so often I read a blog post which says exactly what I am thinking but in a more eloquent way than I ever could. Amanda Coleman’s blog post about swimming against the tide was one such occasion amandacomms1.wordpress.com/2016/02/14/swim-against-the-tide/. There is so much pressure on people to behave in a certain way, think in a certain way, sometimes even speak in a certain way. I honestly love it when people who (think they) know me in real life read my blo and find nuggets of information about me which come as a shock to them. To be perfectly honest I have never been the kind of person you can treat like a computer. What I mean by that is my programming is a little more complicated than a simple case of “If 2 plus 2 equals 4 then input 4” (I know my knowledge of BASIC computer programming is very – well – basic, not to mention rusty, but I think that would work as a like of programming). I think I have blogged about this before – or at least mentioned it in a blog post – but I have a particular difficulty with spiral staircases. For those of you who can calculate angles at a glance I don’t suppose your average spiral staircase poses too many problems??? Me??? I have three angles to work out in very quick succession. The downward angle of the staircase itself. The angle of the spiral. The angle of the tread of the steps in relation to the central pole. No wonder I avoid those things as much as possible. Seriously though – we would all be better off if we not only accepted each other’s digfferences but actively encouraged people to be themselves. You never know we might learn something unexpected from the deep thinkers, the creative types, and those of us with a sideways view of life. Sometimes what initially seems like the easiest route turns out to be the most difficult – especially when you get into difficulties and everybody else is too busy trying to save themselves to worry about you.